I am very pleased that Monika Sobjeko agreed to share some of her experiences of using corpora in class. If you have used corpora in your teaching and would like to write about it get in touch or send me a link to a post you have written or will write. And don’t forget the Google+ group (link in menu above) to link up with others interested in the language teaching and learning aspects of corpora. Over to you Monika. 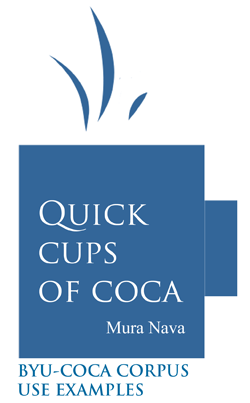 I wish to begin with a word of warning: COCA is a highly addictive tool. I’ve spent many happy hours, using it both in and out of the classroom. I think it’s been a good choice, though there are some limitations, of which I’ll say a few words later. COCA is freely available and it’s got a user-friendly interface (with lots of help menus whenever and wherever you need one). It’s also linked to related corpora, including the British National Corpus (BNC), and other resources such as WordAndPhrase. Initially, I explored it mostly for fun, but I quickly realized that it can considerably speed up the process of preparing exercises and tests for my students. It offered plenty of authentic examples of lexical items and grammatical structures – COCA is huge (currently, 450 million words). I only had to sift through concordance lines, eliminating (or slightly adapting) those that would be too difficult for a particular group of students. Still, I was somewhat reluctant to try any ‘hands-on’ activities with my students, using COCA directly in class. Our syllabi simply do not allow us any leeway, so to speak – no fooling around and wasting our students’ time with any ‘experimental tools’. However, I was teaching an academic writing class, and I thought that it could be a valuable tool for my students – side by side with dictionaries. After all, I’d been using COCA myself to confirm my poor, non-native speaker intuitions about language… If I found it valuable, so could they. I also did a quick literature review and found some support in Ken Hyland’s positive approach to the use of corpora in the writing classroom. He claims that “the use of corpora and concordancing offers one of the most exciting applications of new technologies to the writing classroom” (Hyland, 2010: 167), and – now, having used it myself with an academic writing class – I couldn’t agree more. I was going to use the corpus as “a reference tool” (Hyland, 2010: 170) and was hoping it could be more or less seamlessly integrated into what we were doing in class. Ana Frankenberg-Garcia (2012, pp.41-42) describes a similar approach – she even claims that there is no need to formally train students how to use a corpus. Speaking of integration, you can find very interesting practical ideas about integrating corpora into production activities (writing and speaking) in this post by eflnotes. Initially, I showed students how to do basic, most useful searches. While writing collaboratively or individually, they were often hesitant about using a particular word or phrase or wanted an alternative to what they already knew. At first, I was doing most of the searches for them, but soon they started performing their own – with or without my help. All we needed was a computer with internet access. They were learning a new skill ‘on the fly’ – exactly when they needed it and as much as they needed in a particular moment. 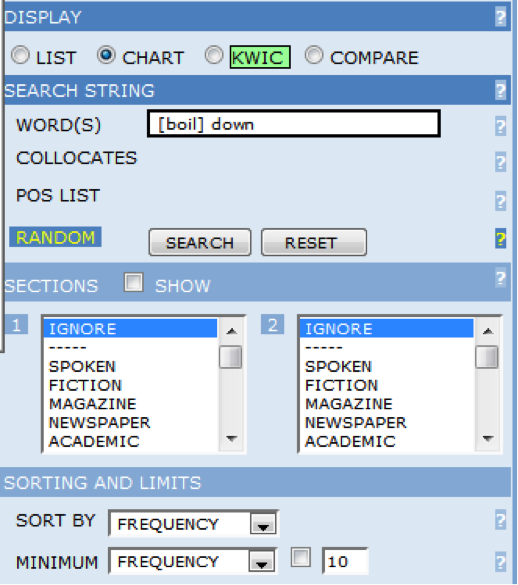 Basically, four types of searches were most useful, or most often performed by my students: 1) frequency search across different registers; 2) collocations search; 3)synonyms search; 4) word comparison search. I will give some examples of searches 1) and 4) done by my students. However, while interpreting this, I think we must remember that, as Hunston puts it, “a corpus will not give information about whether something is possible or not, only whether it is frequent or not” (2010: 22). Ultimately, we have to rely on native speaker intuition to decide whether something is acceptable English or not. Still, I would argue that a lot of helpful information can be collected from frequency searches to help student writers make well-informed choices. The search for synonyms was a life-saver sometimes – but I’m really not sure whether a thesaurus wouldn’t be enough for those particular searches. Often, however, they were then followed by other queries – when a student needed to look at more concordance lines to get a better ‘feel’ for the newly discovered synonym, or to better understand the differences between two synonyms. Do look here at eflnotes for an excellent example of such a life-saving search for a synonym. 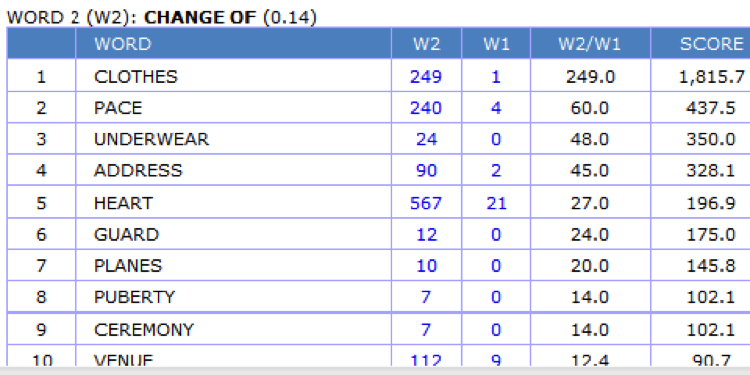 A very interesting option offered by COCA are word comparison searches. 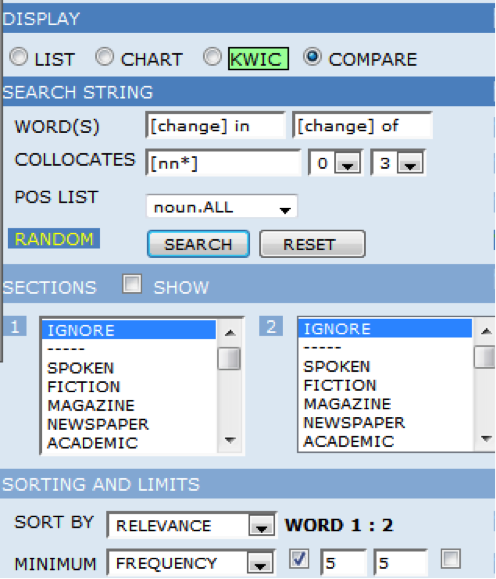 Below are the settings for such a word comparison search – between two noun + preposition combinations: “change of” and “change in” as well as the results of that search. On the basis of this information, my students concluded that “change of” meant that one thing was substituted for another, and “change in” implied a difference occurring in something, and hence – it was better to write ‘a change in temperature’ rather than ‘a change of temperature’. No dictionary could help us with that problem. Finally, I’ll just give voice to my students – most of those who responded to a short survey at the end of the course found the corpus useful (9 out of 12 students), and only one – not useful. And, surprisingly, most of them (eight students) admitted to using COCA both in and out of class. Many commented on the use of COCA in a positive way. Were they just being nice to the teacher while filling in the survey? I wonder. The last comment reflects my own experience of using COCA – namely, it is a general corpus. If your students are interested in a specific field or in writing specific types of texts (genres), building a small, specialist corpus might actually be a better option. Hunston, S. (2010). 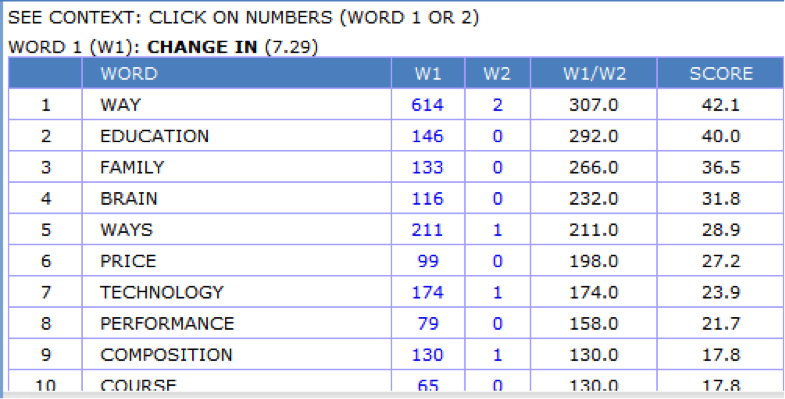 Corpora in Applied Linguistics. (7th ed.). Cambridge: Cambridge University Press. Hyland, K. (2010). Second Language Writing. (8th ed.). Cambridge: Cambridge University Press. Monika is a graduate of the Jagiellonian University in Krakow, Poland where she teaches EFL and ESP to students of archaeology and computer science. She also teaches an academic writing course to graduate students of the university. Her main interests include exploring effective ways to teach writing in a foreign language and using language corpora in EFL. She tweets @SobejM. This is a great post. Thank you for sharing your (and your students’) experience using COCA in class. I’m also not allowed to be “experimental” at work, but I’m about to start teaching a writing curriculum and I see where I can fit COCA in. Thanks! Hi, thanks – glad you find my post useful. Not all of my students enjoyed using COCA equally well, but many did. It’ll really be interesting to compare experiences once you try COCA out with your students. Thanks! Hi, Monika! It’s my first time to encounter COCA. I can’t wait to try it. I teach business writing and IELTS writing. But I do agree that devoting time for vocabulary is one way for students to write easier. Many of them can’t expand their thoughts due to limited vocabulary. Great post! thanks for commenting, am sure monkia will respond in due time. I would like to contact you. Where should I write?